This article is about all the different forms of square dance. For specific details on the American traditional forms, see Traditional square dance. For specific details on the standardized American form, see Modern western square dance. For other uses, see Square dance (disambiguation). Bent Creek Ranch Square Dance Team dancing at the Mountain Music Festival, Asheville, North Carolina. The various square dance movements are based on the steps and figures used in traditional folk dances and social dances from many countries. Some of these traditional dances include English country dance, Caledonians and the quadrille. In most American forms of square dance, the dancers are prompted or cued through a sequence of steps (square dance choreography) by a caller to the beat (and, in some traditions, the phrasing) of music. In some forms of traditional square dancing, the caller may be one of the dancers or musicians, but in modern Western square dancing the caller will be on stage, giving full attention to directing the dancers. Modern Western square dances are not learned as complete routines; the dancers learn basic movements, each with its own distinctive call, but do not know in what order they will be called. The American folk music revival in New York City in the 1950s was rooted in the resurgent interest in square dancing and folk dancing there in the 1940s, which gave musicians such as Pete Seeger popular exposure. Terminology: In the United States, in general, people go to square dances and call it square dancing. In England, Ireland and Scotland, people go to all sorts of dances at which some of the dances will be square dances, but they don't say that they are "square dancing". The majority of dances at such events will be in the form of longways sets, sets of four (two couples with the men diagonally opposite each other, like the side couples in a square), three-couple or four-couple sets or circassian circles. Conversely, people not familiar with the various different forms of dance may ask for an evening of square dance meaning simply a barn dance where many different formations of dance are used. It is possible to go to one of these "square dances" and not do a single actual square dance all evening. Traditional square dance, which is also called "old time square dance". Traditional square dance is not standardized and can be subdivided into regional styles. The New England and Appalachian styles have been particularly well documented; both have survived to the present time. There are several other styles; some have survived or been revived in recent years, some have not. Traditional square dance is frequently presented in alternation with contra dances (particularly in revival groups) or with some form of freestyle couple dancing (at surviving local events). One ancestor of New England style square dances is the quadrille, and older New England callers occasionally refer to their squares as "quadrilles." Where traditional square dance has been revived, it encompasses a wide range of new choreography. Modern Western square dance (MWSD), which is also called "Western square dance", "contemporary Western square dance", or "modern American square dance". Modern Western square dance evolved from the Western style of traditional square dance from about 1940 to 1960. Traditional Western square dancing was promoted beginning in the 1930s by Lloyd Shaw, who solicited definitions from callers across the country in order to preserve that dance form and make it available to other teachers. Since the 1970s modern Western square dance has been promoted and standardized by Callerlab, the "International Association of Square Dance Callers". Modern Western square dance is sometimes presented in alternation with round dances. This modern form of square dancing is taught in around thirty countries. As well as the USA and Canada, this includes the United Kingdom, Australia, Belgium, France, Germany, Denmark, Sweden, Norway, Finland, Switzerland, the Netherlands, Australia, China, Japan and Russia. Within Europe, the majority of square dance clubs are in Germany and the United Kingdom. All teach the Callerlab syllabus. The initial stage reached by all dancers is called Mainstream. This program consists of a 'core' list of about 70 moves which is revised periodically. Because of this standardization, it is possible for anyone with the proper training to enjoy modern Western square dancing in many countries around the world; although instruction is typically given in the local language, the calls are always in English. Playford: John Playford published The English Dancing Master in 1651. Eight of the 105 dances are square dances, many exhibiting concepts that we still use today such as the Heads performing an action and then the Sides repeating the same action. Three of the dances, such as "Dull Sir John", actually state "A Square Dance for Eight thus" (see the diagram on the right). Square dances such as "Newcastle", one of those original eight, are still very popular today, and countless new dances have been written in the Playford style, or English country dance (ECD) style as it is known in the United States. Folk Dance /Barn dance: At English folk or country dances a very wide range of dances is performed, many of which are square dances: Playford style dances; dances derived from the quadrille, for example "La Russe" published by H.D. Willock in the "Manual of Dancing" (c.1847); regional traditional folk dances such as the "Goathland Square Eight" and the "Cumberland Square Eight"; American traditional square dances; plus countless new square dances written in the 20th and 21st centuries. Céilidh: Ceilidhs often include square dances. At English Ceilidhs the same squares may be done as at folk dances or barn dances, but with more stepping. Stepping includes skip steps, hop steps, polka steps and rants. Square Dance: In Britain Square Dancing is formally organised by clubs affiliated to the British Association of American Square Dance Clubs, who also organise the teaching of Modern Western square dance to Callerlab definitions. Unless otherwise stated, a square dance is run according to the Callerlab syllabus by a caller who is either a member of Callerlab or of the Square Dance Caller's Club of Great Britain. The level of dancing is indicated on the publicity material, e.g. 'Mainstream' or 'Mainstream with Pre-Announced Plus'. This is fully described in the main Modern Western square dance entry. It is increasingly common to see Céilidh and Barn dance events advertised as being a Square Dance which can be misleading. Céilí: Ceili dances cover a wide range of formations, including many square dances. Irish set dance: Square dances with strong regional associations. Tops (rather than Heads) and Sides are used extensively. Stepping, often with a flat-foot polka step is normal. Scottish country dance: Scottish dances cover a wide range of formations, including many square dances. Modern Western square dance is practiced in many countries throughout the world. Square dancing is typically "called" (directed verbally by an individual, the caller) in English language throughout the world. Once a person learns the calls, the person can generally dance internationally. However, as may be expected, there are slight style and call title variations throughout the world, although all Modern Western square dance forms are based on the Callerlab definitions. Couple numbering in a square dance set usually begins with the couple nearest the head of the hall (the side of the room containing the musicians and caller, or in the pre-caller era, the royal presence or other hosts or important guests). This couple is the "first" or "number one" couple. If most of the figures are danced between facing couples across the set, as in the 19th century quadrille and dances derived from it, the couple opposite the first is the "second couple". The first and second couples constitute the "head" or "top" couples (or the "head and foot" couples); the third and fourth couples are the "side" couples. In the 19th century quadrille, the third couple is to the first couple's right. In Irish set dances, the third couple (sometimes termed the "first side couple") is to the left of the "first top couple" (the couples facing the first top and first side are the "second top couple" and the "second side couple" respectively). If most figures are danced around the set, with one or more couples visiting the others in turn, the couples are likewise numbered around the set. In 17th century England they were numbered clockwise, with the second couple to the first couple's left. In most present-day American square dance traditions, the couples are numbered counterclockwise: the second couple is to the first couple's right, the third couple is across from the first, and the fourth couple is to the left of the first. The first and third are "head couples" or "heads" (or, in older parlance, the "first four"); the second and fourth are "side couples" or "sides" (formerly "side four" or "second four"). In this context a "call" refers to the name of a specific dance movement. It may alternatively refer to the phrase used by a caller to cue the dancers so they dance the specified movement, or to the dance movement itself. It mirrors the ambiguity of the word "dance", which may mean a dance event, the dancing of an individual to the playing of one piece of music, or dancing in general. In many communities, especially in Scotland and Ireland, the dancers are expected to know the dance and there is no caller. A square dance call may take a very short time or a very long time to execute. Most calls require between 4 and 32 "counts" (where a count is roughly one step). In traditional square dancing the timing of a call is dictated by tradition; in some regional styles, particularly that of New England, the dance movements are closely fitted to the phrases of the music. In modern Western square dancing many calls have been given formally specified durations, based partly on direct observation of how long it takes an average dancer to execute them. Traditional and modern Western square dancing have a number of calls in common, but there are usually small differences in the way they are performed. For example, the "Allemande Left" is traditionally performed by grasping left hands with the other dancer, pulling away from each other slightly, and walking halfway around a central axis then stepping through. In modern Western dance the grip is modified so that each dancer grips the forearm of the other, and there is no pulling (that is, each dancer supports his or her own weight). These modifications make it easier to enter and exit the movement, and thus easier to incorporate it into a long sequence of calls. Traditional square dance uses a comparatively small number of calls—between about ten and thirty, depending on the region and the individual caller. (Many traditional square dance calls are similar or identical to contra dance calls, which are described at contra dance choreography.) New dance moves are explained by the caller. In Modern Western square dance the participants are expected to have learned and become proficient in a particular program, a defined set of calls. Dancing Modern Western square dance is constantly challenging and surprising due to the unknown or unexpected choreography of the caller (that is, the way the caller ties together the "calls" and the formations which result)—unlike traditional square dance, very rarely are two modern Western dances ever alike. Like traditional square dancing, recovering from occasional mistakes is often part of the fun. Dancers are encouraged to dance only those programs at which they are reasonably proficient, the default level of achievement being the Mainstream program. All programs are set by Callerlab, the callers' international association, which also governs the training of callers. 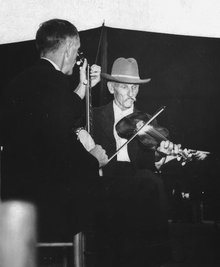 Old-time fiddlers often accompany traditional square dances. Irish and Scottish dances are normally done to traditional tunes. English dances may be done to traditional tunes, though, especially at ceilidhs, there is experimentation with many different musical styles. The two types of American square dance are accompanied by different types of music. Traditional square dance is almost always danced to live music. Since the 19th century, much of the square dance repertoire has been derived from jigs and reels from Scotland and Ireland, sometimes in relatively unaltered form, sometimes as played in the old time music tradition or as adapted by other cultures such as that of Quebec. This sort of music is played on acoustic instruments, such as the fiddle, banjo, guitar and double bass; certain instruments, including the piano, accordion, concertina and hammered dulcimer, are popular in specific regions. In some communities where square dancing has survived, the prevailing form of music has become popular songs from the 1930s, 1940s and 1950s, played on instruments such as saxophones, drums, and electric guitars. Tempos can vary from around 108 to more than 150 bpm, depending on the regional style. Modern Western square dance is danced to a variety of music types, everything from pop to traditional country to Broadway musical to contemporary country music—even rock, Motown, techno and hip-hop. The music is usually played from recordings; the tempo is also more uniform than in traditional dancing, as the "perfect" modern Western square dance tempo is 120–128 bpm. At this speed dancers take one step per beat of the music. Modern Western square dance is organized by square dance clubs. The clubs offer classes, social and dance evenings, as well as arrange for larger dances which are usually open to the general square dancing public (i.e. non-club members). Larger dances sometimes request a strict western-style dress code, which originated in the late '50s and early '60s and is known as "traditional square dance attire", although it was not traditional before that time. Clubs may choose to advertise their dances as requiring less strict dress codes known as "proper" or "casual" (no dress code). Modern Western square dance events in Britain are increasingly seen as having a relaxed dress code, although many dancers do like to wear "traditional square dance attire". In the United States dance groups often have no particular dress code and lines between the forms of square dancing have become blurred in recent years. Traditional-revival groups typically adopt very casual dress and traditional-revival choreographers have begun to use basic movements that were invented for Modern Western square dance forms and a few modern Western callers incorporate older dances from various traditions, such as New England or Appalachian, into their programs. 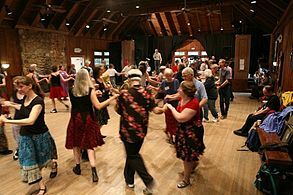 Where traditional square dancing exists as a community social dance (sometimes in the form of a Barn dance or a Ceilidh) people often dress up a bit, though their clothing is not square-dance-specific. 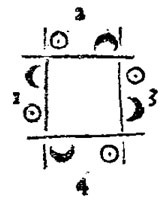 Hexitation: a square with two couples in each of the Head positions. Twelve Reel: a square with three people on each side, normally a man with a lady on either side of him. Bigon: a square with four people, each of whom dances his/her own part and that of their opposite. Almost exclusively done by challenge level dancers due to the extreme mental flexibility required to grasp this difficult concept. Modern choreography also includes dances which morph from one form to another. There are contra dances and four couple longways sets which turn into a square dance part of the way through the dance and then back to the original formation. Grid Squares are dances where the squares are arranged in a grid, sets carefully aligned across the room and up and down the room. The calls move dancers from one square to another in intricate patterns. ^ Szwed, John, Alan Lomax: The Man who Recorded Music, Penguin, 2010. Cf. p.144: "Margot Mayo was a Texan who pioneered folk music in New York and spearheaded the revival of folk dancing and square dancing there in the 1940s"
^ Cf. Cantwell, Robert, When We Were Good (1996), Harvard University Press, pp. 110, 253. ^ "To Hear Your Banjo Play", film short, 1947 with Pete Seeger, Woody Guthrie, Sonny Terry, Margot Mayo's American Square Dance Group and others. Written by Alan Lomax and narrated by Pete Seeger. ^ "CALLERLAB Website > Home". www.callerlab.org. Retrieved 19 March 2018. Friedland, LeeEllen (1998). "Square Dancing". In Cohen, Selma Jeanne (ed.). International Encyclopedia of Dance. 5. New York: Oxford University Press. pp. 685–690. Mayo, Margot (1943). The American Square Dance. New York: Sentinel books. 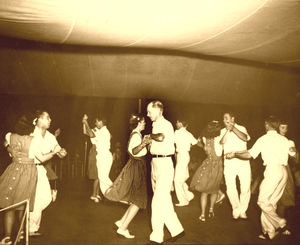 Wikimedia Commons has media related to Square dance. Square Dance Foundation of New England has an extensive collection of books, records, photographs and other materials relating to the history of both traditional and modern square dancing. On the site are interviews with many callers and recordings of dances from the early 1960s.